Beautiful detail inside Neskhons' sarcophagus. Part of a large, ancient Egyptian sarcophagus acquired and sold by the Merrin Gallery, Neskhons' mummy was accompanied by the traditional amulet and falcon pendants. While dwarfed by the size of the sarcophagus and the elaborate decoration, these items hold great significance. The amulet, called a "heart scarab", is a large, beetle-shaped object, usually of green stone or faience, that was placed over the heart of the deceased. Its form is significant. Because the larvae of the scarab beetle emerged from a ball of dung in which they incubated, it appeared as magical regeneration to the ancient Egyptians. It also came to represent the reappearance, each dawn, of the Sun and became associated with the god, Khepri. 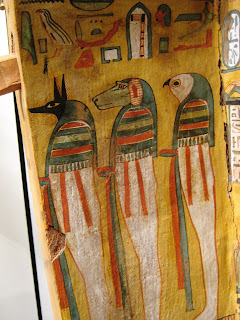 Nekhons' mummy. The back view of the heart scarab reveals the inscription. In rituals prescribed in "The Book of the Dead", the scarab was used in the "weighing of the heart ceremony", in which it was set upon a balance scale against a feather of truth, to determine the individual's fate in the afterlife. An inscription beseeches the heart scarab not to bear negative testimony. Interestingly, the heart scarab of Neskhons is not inscribed to him but to its original owner, Akhbitet, identifed as the servant of god (i.e., priestess of Isis). It is assumed that Akhbitet and Neskhons were related, thus the reusing of the amulet. The two wax winged falcon pendants, also found on Neskhons' mummy were, like the scarab, in a protective coat of natron and bitumen, wrapped in fine linen. Small winged pendants represent an aspect of the spirit called "ba-bird". 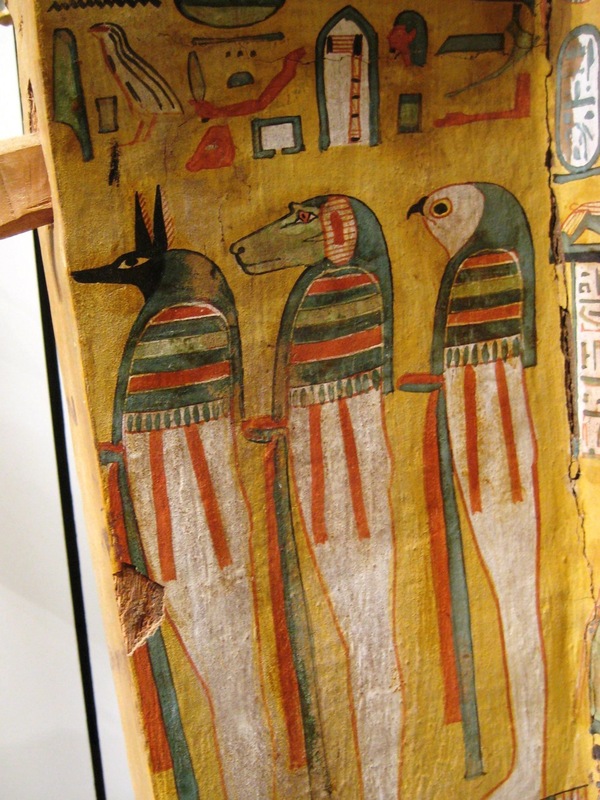 Ba-birds retained the power of flight to enable the soul to leave the body in order to travel as it chose, perhaps to visit relatives, before returning to (metaphorically) animate the mummy.